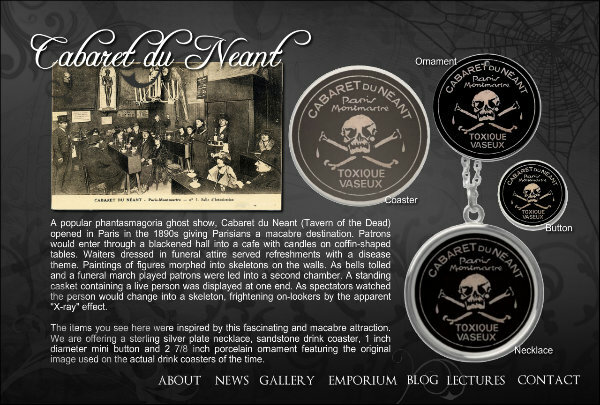 A popular phantasmagoria ghost show, Cabaret du Neant (Tavern of the Dead) opened in Paris in the 1890s giving Parisians a macabre destination. Patrons would enter through a blackened hall into a cafe with candles on coffin-shaped tables. Waiters dressed in funeral attire served refreshments with a disease theme. Paintings of figures morphed into skeletons on the walls. As bells tolled and a funeral march played patrons were led into a second chamber. A standing casket containing a live person was displayed at one end. As spectators watched the person would change into a skeleton, frightening on-lookers by the apparent "X-ray" effect. The items you see here were inspired by this fascinating and macabre attraction. We are offering a sterling silver plate necklace, sandstone drink coaster, 1 inch diameter mini button and 2 7/8 inch porcelain ornament featuring the original image used on the actual drink coasters of the time.